Christmas is a season that brings many traditions. Among them; watching Little Women, walking around Downtown Ottawa to see all the bright lights, decorating our home, and doing lots of holiday baking. 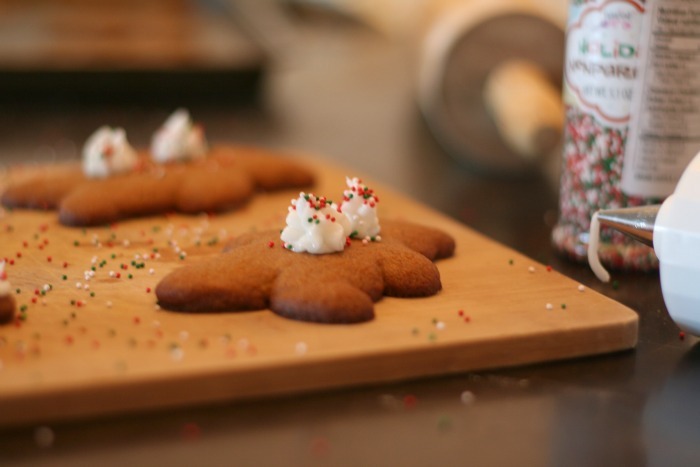 Gingerbread cookies are a classic and everyone enjoys making them and eating them. 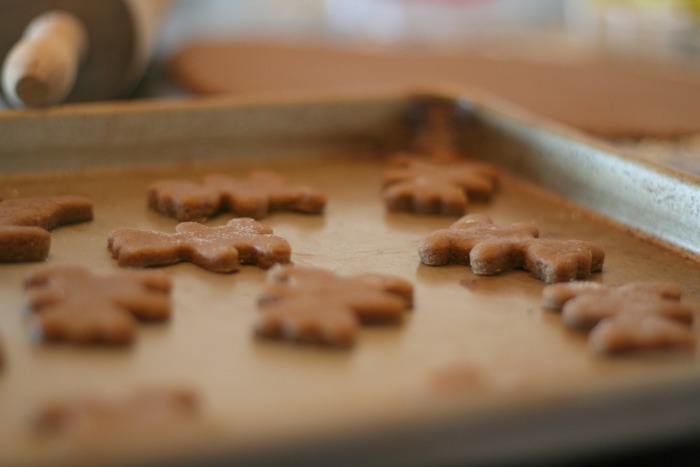 I love the way our house smells while they are baking, I love that you can bite into one three days later and it tastes even more delicious than straight out of the oven. You can even poke a hole in the top of one of your men before they bake, so afterwards you can string some baking twine through and make a Christmas ornament! Before I get ahead of myself, I'm Emily from The Best of this Life. 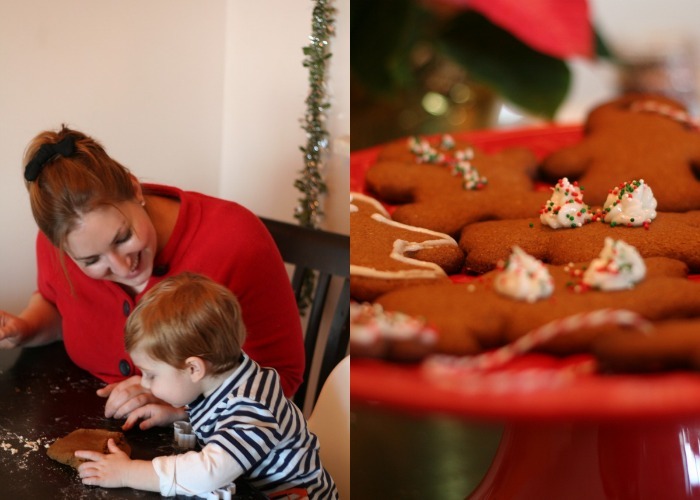 Jessica asked me to create a holiday post for you, her lovely readers. 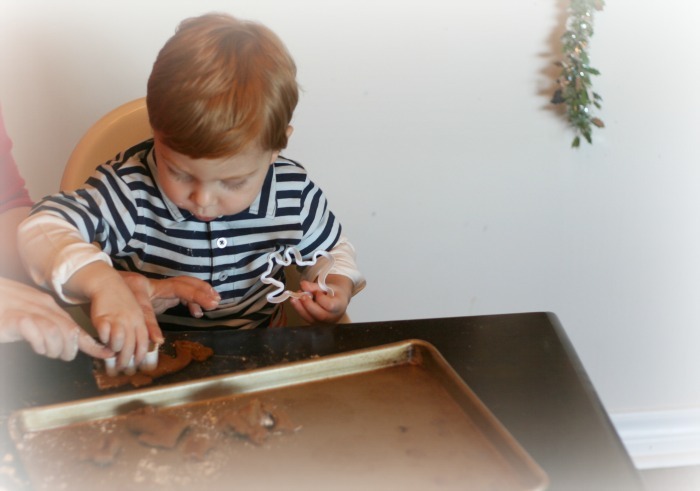 I thought that sharing a family cookie recipe with you all would be the best I could offer! So Little A. and I made up a big batch of these last week, as to show you just how much fun they can be. This recipe is gluten-free and can also be made dairy-free by using margarine instead of butter. With all the parties around the holidays, it's nice to offer some allergen-free options for guests. How you decorate them is up to you! I've made an icing glaze before, with coconut oil and icing sugar, which was quite nice. This time around, I made a simple butter cream frosting and sprinkled some Christmas-colored sprinkles on top. In a large bowl, combine all flour, spices, baking soda and salt. Whisk together. In a separate large mixing bowl, cream butter and sugar together. Then add in the molasses, egg and maple syrup. Begin adding the dry ingredients into the wet ingredients bowl in increments. Stir as you go, creating the dough. When it's all combined, you will have a moist dough. Separate the dough into two balls. Cover with wax paper and refrigerate for 1h30. Remove dough from fridge. Dust a clean working surface with gluten-free flour and your rolling pin as well. Roll dough to 1/2 inch thick. Begin cutting out the cookies with selected cookie cutters. Preheat oven to 350 F. Place cookies on no-stick baking sheet (or use parchment paper) and bake in the oven for 12 minutes. Cool completely before icing and decorating. I hope you enjoy these cookies as much as we do! Wishing you and yours a lovely holiday season filled with laughter, wonderment and every good thing. Thanks so much Emily! They look so yummy! 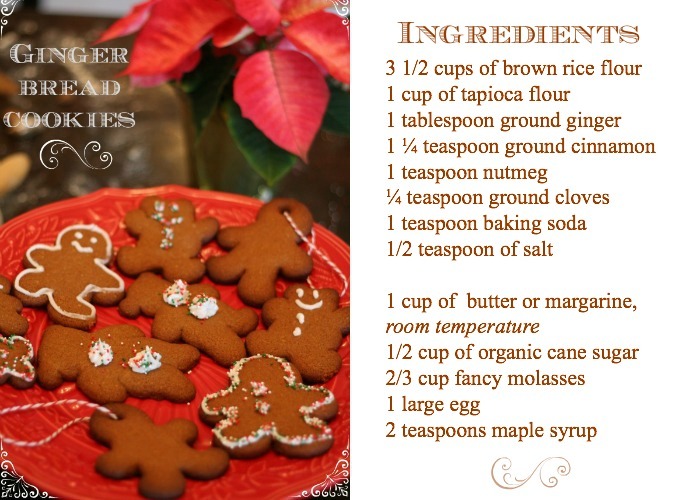 Gingerbread cookies are one of my faves! And your little guy is too cute! Look at those cheeks! Very cute! I'm always looking for new gluten-free recipes, can't wait to give these a try! Love the photography! These tasty treats would make a wonderful gift! Oh, wow! These look amazing! I especially love the dollop of icing... yum! Loved this post so much! Emily is the sweetest! And how gorgeous are the photos?! love love love! Yum I need to try these! Oh that's really nice. If I've got time, I should make these for my boyfriend's mother.